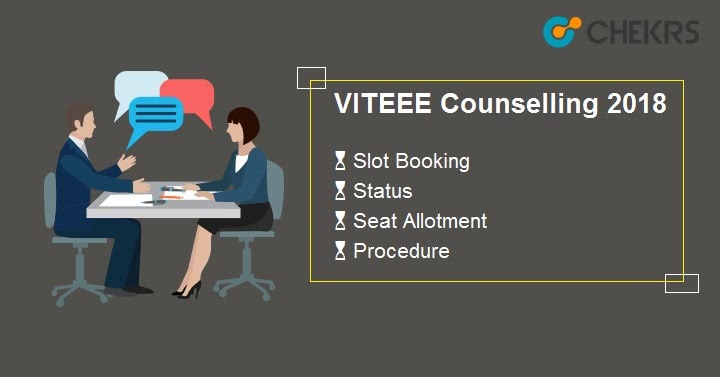 VITEEE Counselling 2018: The University of the VIT will conduct the VITEEE counseling for the candidates in the offline mode. The counseling of VITEEE is divided into two phases i.e. Phase I and Phase II. For those candidates who want to attend the VITEEE Couselling have to visit the counseling as per the rank and the time allotted to them. It is mandatory for the entire candidate to bring the aadhaar card, Admit card, important documents for the counseling, and the copy of the result on the spot of the counseling. The detail regarding the VITEEE counseling process, important dates, slot booking, allotment of seat are provided below the article. For those candidates who were attending the VITEEE Counselling have to know the process. For that purpose, we provided here the stepwise process of the counseling. Candidate can follow this flowchart for their simplification for the VITEEE Counselling Process. The VITEEE conducts the counseling on the different dates according to the rank of the candidate obtained in the exam. It is mandatory for the candidate to appear on the date and time allotted to them during the counseling. So we provided here the detail of the VITEEE Counselling dates according to the rank obtained by them. VITEEE conducts the counseling on two phases at the different slot of time. It is necessary for the candidate to be on time and date which were allotted to them. If the candidates fail to do so then they will not get the chance for visiting in the counseling. The phase I of the VITEEE counseling is divided into three slots with three different days each day is divided into 3 different slots. So the candidate must see the clearly their time and slot allotted to them and must present on the date and time allotted to them for the VITEEE Counselling Phase 1. The details regarding the VITEEE Counselling Phase I slot and Time are provided below the table. Candidates can check their time and slot according to the rank obtained by them. The Phase I of the VITEEE counseling is held in Vellore, Chennai, Bhopal, and Amravati. So the candidates who living far book their ticket in the advance so that they can reach on date and time. The phase II of the VITEEE counseling is divided into three slots with three different days each day is divided into 3 different slots time. So the candidate must see the clearly their time and slot allotted to them and must present on the date and time allotted to them for the VITEEE Counselling Phase II. The details regarding the VITEEE Counselling Phase 2 slot and Time is provided below the table. Candidates can check their time and slot according to the rank obtained by them. The Phase II of the VITEEE counseling is held in Vellore, Chennai, Bhopal, and Amravati. So the candidates who living far, book their ticket in the advance so that they can reach on date and time. For the candidates who want to take the admission in the Bhopal campus, they can apply for the counseling at the center of VITEEE. The dates along with the rank of the VITEEE Counselling at Bhopal campus is provided below the table. Candidates can book their slot, time and date and date for the exam test as per their convenience till 24th March. Candidate will get the hall ticket of their exam on the day when they registered for their slot scheduled. So we provided here VITEEE Slot Booking important dates along with the steps. Candidates who want to know the slot booking process can follow this process. Candidates are required to book their VITEEE slot by entering their password and the application form no. in online mode. After logging candidates have to choose dates as well as the time of the exam center where they wish to appear for the exam. The VITEEE slot booking is on the real-time basis, so candidates are required to fix time frame so that they can book their test slot according to their convenience. While booking for the VITEEE slot, candidates are required to check the address and detail of the exam center where they want to appear for the exam. It is mandatory to book the slot by the candidates so that they can download their admit card. As the admit card contain the details of the center etc. If the candidate is not able to book the slot then the slot for the candidate is booked automatically by the university on the basis of the information provided by the candidate in the application form. Candidates have to bring the aadhaar card, Admit card, copy of the VITEEE result, and all important documents for the counseling. The detail regarding the VITEEE counseling process, important dates, slot booking, allotment of seat are provided in this article. Hope it will help you to follow all the procedure effectively.